I agree with the majority of what you're saying and I do feel overall we can benefit from wind energy. However, why is it that these turbines are always constructed in locations that ruin the natural beauty of a community. The Cape Wind Project where I live on Cape Cod would do just that and so too would the project proposed there in Lincoln. The beauty of the Rollins ridgeline and lakes surrounding would be ruined. When people come to Cape Cod to vacation or Lincoln to vacation, they don't want to be staring at wind farms and listening to them. 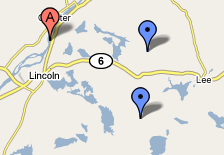 The beaches are Cape Cod's greatest assets and the mountains and lakes are Lincoln's greatest assets. These areas should be preserved not industrialized. First Wind should find someplace to construct their towers where they won't be seen or heard. Joe, you continue to be such a wind zombie. Even as you start to realize a tiny portion of the huge downside of industrial wind, you keep going back to the folly. What is it that you don't understand about the $23.37 per mwh (US Energy Information Admin., 2008) being a bad deal for taxpayers when we have a $12 trillion debt? Why should First Wind, on the verge of bankruptcy with Stetson II mothballed and no investor (still the case, BTW)for the Rollins project, get a $115 million bailout from Obama? Why do you believe that ratepayers should be burdened with a mandate to pay for costly, unpredictable, unreliable trickles of wind electricity? The Rollins "wind farm" is nothing more than a destructive "subsidy plantation". The one thing that could help Lincoln is a tie into cheap, renewable Hysro Quebec power. I bet Keith Van Scotter would love to get 4 or 5 cent per kwh electricity for LP & T rather than face 20 to 30 cent per kwh wind costs. Think about it and stop being a victim of the Big Wind/Big Lie propaganda machine. Stetson II was completed late last year and should be operational soon. Rollins is looking to get started in August when they will begin making roads a into the site and construct the foundations for the towers.